A sprained ankle injury is potentially the most frequent sports injury but it can occur at any time to anyone by simply slipping and twisting your ankle ligaments on uneven ground far away from the sports field. The ankle Joint is a hinged joint that allows for an up and down motion of your foot, also referred to as dorsi and plantar flexion. The Subtalar Joint is situated below the ankle joint and allows for lateral and medial side to side ankle motion. A strained or sprained ankle refers to damage to the ligaments and soft tissues that surround and support your ankle joint. The most common type of ankle injury accounting for over 80% of injuries is an inversion ankle injury. This is when your foot rolls inward and your ankle rolls or twists over moving your body weight to the outside aspect of your ankle joint. An inversion sprain will normally involve injury to your anterior talo-fibular ligament (ATFL) and lateral collateral ligaments. Other local soft tissues such as tendons and muscles may also be damaged. This is a much less common ankle injury but occurs when the opposite movement to an inversion injury occurs causing damage to your medial ankle ligaments also referred to as the deltoid ligament. A high ankle sprain refers to an injury to the syndesmotic ligaments above the ankle joint that connect the two lower leg bones, the tibia and fibula. They typically occur when the dorsiflexed foot twists outwards as in an eversion type injury but also involve a simultaneous internal movement of the shin (tibia) bone. A high ankle injury usually takes longer to heal than a standard lateral or medial type ligament strain and may require specialist treatment. When a ligament is subjected to a force it may often be strained and may even tear to varying degrees. However, occasionally small pieces of the bone to which the ligaments attach may be torn away from the bone with the ligament and if this occurs it is referred to as an avulsion fracture. There is mild damage to your ligament, usually with less than 10% of the soft tissue fibres being involved. You should expect mild pain with ankle movements and your ankle may be tender to touch. There may be some swelling and bruising, but no associated instability. You can usually walk normally following a grade 1 sprain. There is moderate damage to your ligament with a partial tearing. There is usually immediate pain with significant swelling and bruising at the time of your injury due to the bleeding. Movement of your ankle will be reduced. You may find it difficult to walk and your ankle may feel slightly unstable. There may often be a popping sounds at the time of the injury and you will have immediate significant pain, swelling and bruising around the ankle and often down into your foot. Your ligament will have ruptured / torn completely. Walking / weight bearing on your injured ankle is often impossible due to the pain and your ankle may feel like it is going to give way and feels unstable. Ecchymosis – this is bruising seen under the skin due to bleeding from the damaged soft tissues. P - Protect against further injury. 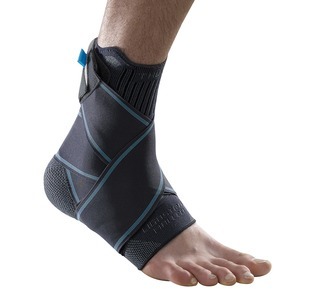 The use of different types of ankle supports and braces can help protect your ankle against further injury during your recovery. 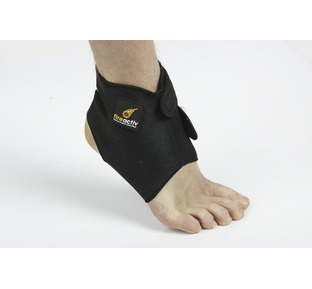 E - Elevate where possible as elevating the injury helps reduce swelling. To correctly elevate your ankle it should be above your heart level. When should I go to the hospital casualty department? I see many ankle injuries in my clinics and without doubt correct diagnosis and early intervention is always best practice. For some injuries the need for continued support is required over a period of months until the injury and surrounding tissues have been fully rehabilitated. 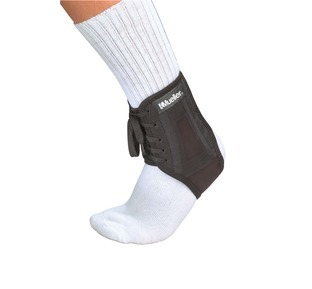 The Pro Sport Ankle Brace is used by many sports men and women during such scenarios but is also without doubt used by many football, hockey and rugby players after full recovery has been made. Why? Simply because it offers a degree of confidence for the wearer while taking part in their chosen activity / sport and because the extra low profile, XLP, is specifically designed to fit into your boot or trainer it is also extremely comfortable whilst maintaining support and allowing the wearer to still be able to run, jump and turn. Slimmon D, Brukner P; Sports ankle injuries - assessment and management. Aust Fam Physician. 2010 Jan-Feb;39(1-2):18-22.